Improving energy efficiency in your home can help you reduce the cost of your utilities each month. One of the main areas of your home where you may use too much energy is your kitchen. The appliances found in your kitchen require a substantial amount of energy in order to function properly, which can prove draining if you are not actively monitoring your power usage in this area. From leaving unused equipment on indefinitely to neglecting your refrigerator coils, there are several mistakes you can make in your kitchen that end up making it harder to save at home. Fortunately, there are a few steps you can take to improve the energy efficiency in your kitchen ahead of your next scheduled utility payment. Once you become more mindful of your energy usage, it becomes easier to increase your energy efficiency. Not only can you save money on your bills, but you can improve the quality of your equipment as well. 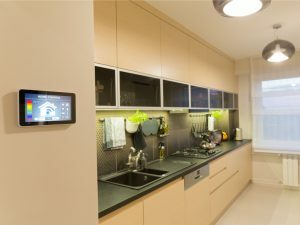 One of the easiest and fastest ways you can improve the energy efficiency in your kitchen is to monitor when you turn off the equipment in this space. If you have an electric stove, the burners remain hot for a while after you have turned off the stovetop and removed your pan from the burner. To increase your efficiency, practice turning the burner off a few minutes prior to removing your pan from the heat. In doing so, you are limiting the amount of time your burner is turned on, which can add up slowly over time to an increase in savings on your utility bill each month. The food in the pan continues to cook even after the burner has been turned off simply because the burner remains hot for such a prolonged period. You are not going to ruin a meal by turning your burner off a few minutes before removing your pan from the heat, but you are going to see several dollars’ worth of savings each month for adopting this practice. You can utilize this same mindset when it comes to preparing food in the oven as well. Many recipes suggest preheating your oven before placing food inside of it, but this is not as necessary as you may think. While some recipes absolutely require a preheated oven, such as when you are baking a cake or making bread, you often do not need to preheat your oven before preparing food in the oven. By waiting to turn the oven on until you are ready to place your food in it, you are reducing the amount of energy you use to run your oven each day. When combined with reducing the amount of time you are using your burners, you can see a substantial decrease in your utility bill over time. Your refrigerator is constantly running at all hours of the day and using a considerable amount of energy while it does. While it does cycle on and off throughout the day as a pre-programed way of conserving energy, the condition of your refrigerator may ultimately determine whether this cycle is working effectively. If your refrigerator coils are dirty, they may not work efficiently, which can lead to an increase of energy needed for your refrigerator to run properly. Clean the dust and dirt off the refrigerator coils at least once every six months to help improve the energy efficiency of your most used appliance. When your refrigerator coils are clean, the air flow through this area increases and allows the refrigerator to run more easily. Another way to improve energy efficiency in your kitchen is to monitor the thermostat for your refrigerator. When your refrigerator thermostat is set at a colder temperature, the appliance must use more energy to maintain this condition. Your refrigerator must remain between 37 and 40 degrees for it to run efficiently while keeping your food cold and fresh. For your freezer, set the thermostat between zero and 5 degrees, as this allows your items to remain frozen but reduces the amount of energy needed to do so. You can save a significant percentage on your energy bill each year by simply adjusting the thermostat on your refrigerator and freezer to slightly higher settings. A dishwasher is designed to use the same amount of energy regardless of how many dishes are placed into the dishwasher before it is turned on. If you are consistently running your dishwasher multiple times a week because you are starting it when it is only partially full, you are increasing the amount of energy you are using by doing so. Wait until your dishwasher has been fully loaded with dirty dishes before running them through the wash. This allows you to more efficiently use your dishwasher because you are monitoring the amount of energy you are using to run this appliance every week. To further increase the energy efficiency of your home, opt for washing your dishes by hand on occasion to save on the energy needed to run your dishwasher. The less you run your dishwasher, the more money you can save on your utility bill each month. If you cannot wait to run the dishwasher until it is full because you have a limited number of plates and utensils, consider hand washing these items after each use. This limits the amount of water and energy needed to clean your plates and ensures you have clean items before each meal. An added tip to help you use your dishwasher more efficiently is to utilize the energy-saving settings that come standard with most dishwasher models. You may not be aware this setting exists, but opting to use the energy-saving mode can save you money on your energy bills each month. When a dishwasher has been placed on energy-saving mode prior to cleaning, the appliance stops automatically once the final rinse has been completed. This decreases the amount of time and energy used to clean your dishes during each washing cycle.